Hey everyone, thanks for joining me for this week’s Monday Money. I’m Josh, the guy behind this column. I’ve covered a bunch of topics here ranging from credit scores to credit cards to budgeting and more. There is one thing that I haven’t talked much about though, and that’s the topic of investing. Truth be told, I’m 25 years old. I haven’t really done anything with investments until about a month ago. I was doing a review of Betterment for Modest Money, and I sold myself in the process. The main pitch for betterment is that it’s a smart way to invest for busy wannabe investors. As far as busy people go, I definitely fit in that category. Being a financial writer, I’ve always known that investing early is important, but I just didn’t have the time or money to try my hand at investing in a company or a business. A little over a month ago, I wrote a Monday Money post that let you guys know that I was going to start investing. I got a lot of great feedback from the readers of that article, and on the 20th of last month, I decided to give it stock market investing a go. Because I received a lot of great feedback about Betterment, I figured with what I learned, there’d be no better place to start. Opening the account was really fast. When I signed up, I filled out a short form, gave them information needed to verify my bank account, made my initial deposit, and set up automatic transfers to avoid the $3 monthly fee. All was going well until the next day. In one day, I’d lost $0.37 of my $250.00 investment. It scared me because if I lost in the first day, I was sure to continue to lose. But, I figured it was only $250.00 and I could really test this program to see if it was good for my readers, friends and family. So, I kept the funds there and watched it closely. Over the next week, my portfolio continued its downward motion. As I grew more and more concerned, I started thinking, “Well, that savings account with .1% interest looks really good right now!”. I was concerned that I wasn’t using the proper allocations so I played around with changing the allocation of my money in stocks and bonds. I started with the suggested 80/20 split being 80% bonds, 20% stocks. That wasn’t working. So, I went to 50/50. Still, I continued to lose. Finally, I went to a split of 26/74 with the vast majority of my money in stocks. Still, I lost. Now, 2 weeks had gone by and I was down almost a full dollar! I figured I wasn’t losing much and decided to keep my investment going. I’m really glad I did too! The following weekend, my returns went way up! I mean, they jumped from the negative to the positive and continued growing from there. I started to think, “Well, maybe there is something to this after all!”. Now, my investments are up 2.7%, I’ve earned over six bucks, and I feel like I’m making the right decision by keeping money in the account and funding it monthly as I was planning to in the first place. You Can’t Watch Stocks Daily – Those first two weeks were scary. I’m sure it would’ve been worse if I had more money in the account, but even with a little bit in there, I felt like a loser. I was losing money! After a full month, I noticed that the trend seems to be down towards the end of the month and way up after the first week of the following month. I’ll let you know if that trend persists as I have more and more experience with my personal investment. Anyway, the main point is, if you watch your stocks on a daily basis, chances are, you’re going to suffer a concussion from beating your head against the wall too much in down times! Allocation Matters – Because stocks have grown much faster than bonds, if I didn’t make the changes in allocation that I did, I wouldn’t have earned such a high return. Granted, I am taking a larger risk every time I put more into stocks by taking from bonds. The bottom line is, stocks are a risky investment, but they can really pay off. Investing Makes Money, Saving Loses It – OK, so this one is a bit hard to explain, but I’ll do my best. When I have money in a savings account, it grows very little. As inflation happens, the growth of my money doesn’t keep up. As the value of my dollar goes down, if the amount of my dollars doesn’t go up, I lose! Being that I’m investing now, I’ve done a bit of research on where my money is, my allocations and what I can expect in comparison to inflation. What I’ve found is that my money in my investments will grow faster than the value of my dollar will drop. That being said, I plan to take everything I have in savings and put it into Betterment. That way, I’m not losing money, day by day as prices go up! What are your thoughts? Do you agree or disagree with my findings and why? Is there any advice that you could give to a young investor like me? Please provide your answers by leaving a comment below! You can’t watch stocks daily. If you are a trader, that’s fine, and you need to be watching more than just daily! – more like every second! If you are a long-term investor, check in quarterly or so. I don’t know if Betterment has automatic re-balancing, but if it does you could check in even less once you feel comfortable with your allocations. Betterment does re-balance automatically. I would say to check in weekly. Other than that, I agree with you! – As you said, don’t watch it daily! You’re investing for the next 30-40 years. Would you really need to look at it every day?!?!? – One good rule of thumb is “your age in bonds”. This means the PERCENT you have allocated in bonds should be roughly close to your age. Because you’re 25 – shoot for around 25% (looks like you have this one covered by going 26% in bonds). I saw the post about age and allocation on your site. As soon as I read it, I made the change to 26% bonds. Thanks! These are some awesome lessons to have learned in one month. I haven’t really began investing in a personal account yet, but I have had a retirement account for over 3 years now. That has taught me the same lessons you’ve already learned. It’s fun to look at the market on a daily basis, but you can’t adjust your allocation based on the daily movement. Also, long-term investing is the way to go. I shouldn’t care if my portfolio goes down 1% in one day as long as it averages 8-10% over in the long run. Thanks for your comment. What do you do with your personal funds? Are you keeping them in savings? If so, have you thought about inflation? Next Monday, I’ll be talking about how inflation makes even free savings accounts cost you something. I hope to see you for that post too! Thanks again! I don’t know who suggested that you start with 80% bonds, but that was obviously incorrect. Not because you lost money with that asset allocation, but because it was too conservative for your age. John Bogle, the founder of Vanguard says a good rule of thumb is to hold your age as percentage in bonds. So in your case, you should have 75% in stocks and 25% in bonds. And you shouldn’t play around with your asset allocation. Don’t change it to follow market returns. Change it because you are getting older, or because you have so much money that you can afford to lower your risk exposure to the stock market. You should probably create an Investment Policy Statement for yourself. From the Bogleheads wiki, “An Investment policy statement (IPS) is a statement that defines general investment goals and objectives. It describes the strategies that will be used to meet these objectives and contains specific information on subjects such as asset allocation, risk tolerance, and liquidity requirements.” The wiki talks about the benefits of having an IPS, the drawbacks of not having one, and then gives an example. Thanks for the great advice. I saw something about this on MoneyAhoy.com and have changed my allocation to match. I apprciate your comment Bryce! I personally have very little in bonds … but I can manage my risk / reward very well. While I agree with the rule of thumb for the general investor, your overall portfolio (even in stock) should be managed in a way where downward stock pressure is managed – the Beta is often used. Hey Passive Investor, I couldn’t really tell you too much about my investments. Really all I do is sign into Betterment and change the allocation as needed. They do the rest. From what I understand, I own a percentage of a share in several different arenas. It seems to be working though! Thanks for your comment. Great post Joshua! I completely agree with the first lesson. I made the same mistake when i started out as well. Watching stocks constantly move up and down made me anxious and prone to bad decisions. On the other hand, when i started investing in less stocks but armed with more research I stopped watching them everyday and took stock once in a week until some major news occured. Thanks Ankit, glad to know I’m not alone! It is exciting to see you getting started. You will have much greater losses than that if you stick with it, but as long as you are dollar cost averaging over many years, you will come out ahead. I don’t know that I would put all savings into stocks. I think you need to keep a bit of an emergency fund that is not subject to the whims of the stock market. Hey Kim, thanks for your comment. I agree with you for the most part, but my money in savings is just shrinking. Is there a percentage or some value that you would say consumers should keep in savings and out of the market? I watch my investments daily, but that’s only because of the tracking with Mint. I don’t give it much thought other than seeing what happens. I know any downward trend means my future investments purchase more. I understand the seesaw though. I bought some utility ETFs watched them seesaw back and forth and then plunge down to a loss of $10 or so. Then the fed made their announcement not to taper and it shot up into the positive range. So you can watch the day to day as long as you stick to the idea that no matter what happens, you will stay the course. Hey Micro, thanks for your comment. I would have gone nuts if I saw such a big drop. Great job on keeping your cool! See ya around! Josh, that watching stocks daily thing can really take you down – glad you learned that lesson. I guess my biggest piece of advice would be what you’ve already learned: just let the investment sit for awhile. Great post! Thanks Laurie, I really appreciate your comments and support! I used to torture myself by checking my Betterment account daily. The thing with investing, though, is that you have to understand that there are ups and downs, it’s it’s natural! Hey Lisa, thanks for stopping by. I’m definitely starting to get a feel for the ups and downs of the industry! I totally agree with you on those Josh. I think you should just let it sit there for a while and not check your investments regularly, so that you don’t have to worry too much. That’s just my opinion though. Hey Mark, I’m starting to see that just about all of us have that same opinion. Thanks for your comment! Good for you for starting to invest at a young age. I didn’t start until a few years later than you. 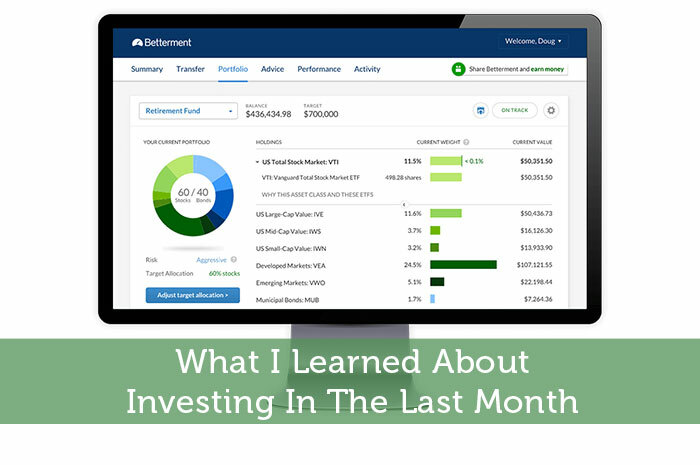 I started off with safer investments such as guaranteed investment certificates and then eventually realized that I could take on more risk because it would be quite some time before I would retire. I think it’s also awesome that you learned so much in a month. I didn’t learn that all right away, but then again, I was letting my financial advisor do the allocating for me in the beginning, rather than being hands on. What little advice I can give you, since I ‘m still a beginner myself is to research as much as you can on the company before you buy their stocks. Only invest in a company that you understand how their business works. Hey Karen, thanks for the kind comments and sharing your advice. One of the things I don’t like about Betterment is that I can’t choose which companies I invest in. But, it seems to work out with the companies they have chosen. Maybe I’ll be purchasing stocks on a stock by stock basis by myself one day soon, I’ll keep ya posted. Thanks again! I have a lot to learn about investing, but I agree with your findings with what I know right now. I try not to look at my investments every day. I just psych myself out that way. Hey Daisy, you and me both! Thanks for your comment! Once you let your emotions to enter into the picture when it comes to investing, you are guaranteed to lose. That is why so many of us are poor investors. We lose a few dollars one day, and overreact and sell out. Then we wait until we see the market rise for a while and buy back in. You can’t watch your investments every day and you cannot let emotions enter into the picture. Couldn’t agree more Jon, thanks for your comment! Great post! My goal is to invest for the long term (stocks I would not mind owning for a few to several years). Take your time and research how the company is doing, use financial statements for each company and definitely try to buy low and sell high when possible. Sounds like a great goal Leona. Thanks for your comment and great advice! You can watch your stock prices daily if you wish, just to keep track of the general trends and any significant events. But don’t check your portfolio balance more than once a month. You’ll drive yourself crazy. I couldn’t agree more Jack, thanks for your comment! You should never look at your investments on a dialy balance and go into it ready to lose 40% . Since 2009 we have a new generation of ealry retirement bloggers who have yet to experience a market downturn. Like they say bears and bulls make monwy but pigs get slaughtered. You’re absolutely right Charles, I’ve never experienced a major downfall. However, I’m sure I will one day…even though I never want to! Thanks for your comment!